Although the purges of the Stalin-era were long gone by the start of the 1960s, religion and many things “foreign” were still frowned upon when Nikita Khrushchev was at the helm of affairs in Moscow. So, I was surprised to stumble upon this hidden gem of an interview, taken by my colleague and friend Elena Krovvidi in 2011. 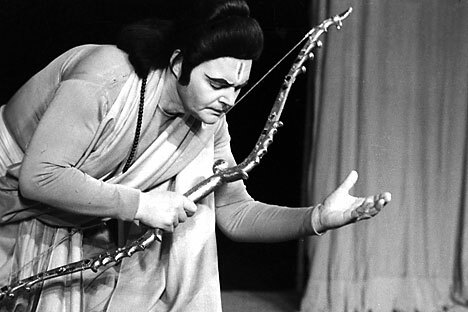 Gennady Pechnikov, a Russian theatre artist took up the challenge of not just co-directing the play but acting as Lord Rama in the first ever Russian stage performance of the Ramayana. These were roles that he did not relinquish for the next 40 years, earning him international acclaim and much love and admiration in India. Such was the reputation of Pechnikov that he developed a personal friendship with India’s then ambassador to the USSR, K.P.S. Menon, who arranged for Jawaharlal Nehru to watch a Russian Ramayana performance in 1961. Pechnikov long maintained connections with India over the decades and was invited by Indira Gandhi to visit the country. Three decades and many trips later, he was awarded the Padma Shri award for his contribution to friendship between India and Russia. Pechnikov went into great detail to describe his admiration for India in the said interview. While Ramayana spread all across Asia and became a part of the culture in countries such as Thailand, Cambodia and Indonesia, the epic did not make large inroads into post-Pagan Russia. Some scholars argue that the epic may have become popularised in the country initially via Mongolia. Even the Kalmyk people, who trace their roots to Mongolia, had an epic that closely resembles the Ramayana. It was only in the 19th century when St Petersburg witnessed a rapid rise in interest in the East that scholars in European Russia began to read the Ramayana. Nicholas Roerich was one of the noted scholars of most of the Hindu epics. Before going on his Altai-Himalaya expedition, the philosopher and artist arrived on the island of Ceylon with mental images of the great epic in his mind. “Ancient Ceylon—the Lanka of the Ramayana. But where are the palaces and pagodas,” he wrote as he first saw the Colombo port. His fascination for the epic was visible as he travelled across the island, which may have been a bit too modern for Roerich. “But, after all, only in fragments do Colombo and Ceylon recall the ancient Lanka of Hanuman, Rama, Ravana and other giants,” he wrote. It wasn’t until 1948 that the Hindu epic was translated into Russian, thanks to Alexander Baranikov, an eminent Indologist. The epic is now available in the country both as a children’s book and in a more serious form for those with an interest in Indian studies. The script for Pechnikov’s Ramayana was presented to him by another eminent Indologist, Natalia Guseva, who read Baranikov’s translation. Pechnikov’s play was recorded into a film and was popular among children during the peak of the Indo-Soviet friendship. One of the best ways to popularise the great Indian epic in Russia would be to make a joint film involving a mixed cast of actors. Russia’s deputy minister of culture said earlier this month that a joint production could be on the cards between film industries of the two countries. A film on the Ramayana would not just familiarise a younger Russian audience with the epic but also foster a tremendous amount of goodwill towards Russia in India. At the same time, an eager Indian audience would get their first glimpse of Russian cinema and its stars. This is an initiative that could be supported by both governments. The Ramayana, one of India’s greatest cultural contributions to the world, has completely transcended religious and cultural boundaries. It’s a shame though that the story seems to have a wider acceptance and belonging across society in countries that stopped being Hindu centuries ago, than the country of its origin. Under present circumstances, the ‘Macaulayite’ lobby in India would term the mandatory introduction of Indian epics into school syllabuses as a “communal” act.